In "Secrets of the Sommeliers: How to Think and Drink Like the World's Top Wine Professionals," Sommelier Rajat Parr and journalist Jordan Mackay offer a immersion course in seeking value, buying, tasting and serving wine and matching wine with food. Buy it now from Amazon.com for just $19.16 in hardcover, a $13.34 saving (41 percent) from the $32.50 list price. Fine wine, as we've often discussed before, is often not only a matter of quality grapes and competent wine making. Real estate also comes into the equation, and as the people who sell it say, the secret of success lies in "location, location, location." In France's Rhône river valley, for example, prime locations include the historic Hermitage hill in the Northern Rhône; the Southern Rhône's answer to Park Place and Boardwalk might be Châteauneuf-du-Pape. Many of the valley's vineyards, lacking this cachet, are designated as generic Côtes-du-Rhône ("Hillsides of the Rhone"), which cover a swath along both the Southern and Northern Rhône; vineyards surrounding a roster of specific villages thought to produce better fruit win a promotion to Côtes-du-Rhône Villages. About two dozen village vineyards are sufficiently regarded to earn the specific name of their village on the label; and from time to time a village gains such a reputation (Vacqueyras and Gigondas, for example) that it's elevated to the distinction of a label under its own name, standing alone. At the bottom of the status ladder, the relatively new designation Vin de France ("Wine of France") identifies the old Vins de Table ("Table Wines"), those that toil without further geographical distinction. But it remains possible for a wine from low-rent district to boast a family tree, and for these wines the old Vin de Pays ("wine of the country") designation remains available. In the Rhône, it's the Vin de Pays du Comté de Grignan that serves the Zen-like status of filling in the spaces between things. Both above and below Montélimar, dividing line that separates the Mediterranean climate of the Southern Rhône from the cooler Continental climate and soil of the North, Vin de Pays du Comté de Grignan stretches 50 miles along the valley, filling in all the spaces not otherwise covered by controlled appellations. Today's wine, Olivier Cuilleras's Domaine la Guintrandy 2008 "Saint-Leger," offers a fine, affordable example of Vin de Pays du Comté de Grignan red. A blend of half-and-half Grenache and Syrah, it belies its downscale appellation with excellent ratio of quality to price. We're reaturing the wines of the Southern Rhône in Wine Focus for March in our WineLovers Discussion Group. Join us as our friendly international crowd of wine lovers share our thoughts, questions and tasting notes on the wines of the the region. To participate, simply click to the topic "Farther on up the Rhône!" As it turns out, I've learned from wine maker Patrick Campbell that the 2009 vintage has just been released, and he thinks its style will be to my liking; and, I hope, to yours. I'm making every effort to get my hands on a bottle and hope to be able to tell you about it soon. FOOD MATCH: Grilled red meat and Rhône reds make natural partners, and some leftover grilled lamb kebabs from a local Jordanian eatery that we had on hand made a splendid match, enhanced by aromatic leftover rice from the same source. VALUE: A quality-price-ratio winner for just over $10. WHEN TO DRINK: It won't fade over the next year or so, but modest red Rhônes aren't really agers, and the slick-sleeved foam synthetic stopper isn't meant for the cellar. The producer's Website is available in French and English. Here's an English-language page about the property's long history. For brief tasting and tech notes on the Saint-Léger, click this link. Wine-Searcher.com has an interesting summary of information about the Vin de Pays du Comte de Grignan, along with links to representative wines. 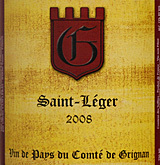 Find limited vendors for Domaine la Guintrandy "Saint-Leger" on Wine-Searcher.com.